Real Love Deserves Real Chocolate®! These luscious strawberries are enrobed in delicious 100% Real Milk, Dark & White Chocolate - never confection. 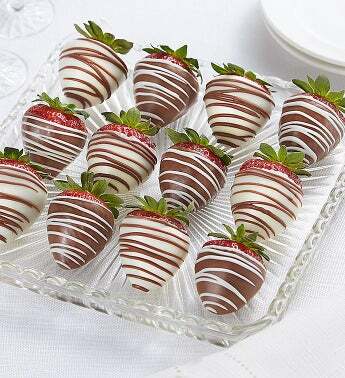 Chocolate Strawberries include Milk chocolate with white chocolate drizzle, white chocolate with milk chocolate drizzle and dark chocolate with white chocolate drizzle. Dark chocolate with white chocolate drizzle .